In 2012, the U.S. Internet service provider from Silicon Valley introduced a further quality filter: Google Penguin. The purpose of this significant update is to examine websites closely and determine whether they meet the quality guidelines for webmasters posed by Google and published on the Internet. The focus is mainly on pages that use unfair methods to positively affect their placement in the search results, without providing the user with a corresponding added value. This type of manipulation, unwanted by Google, is also known as Search Engine Spamming or Black Hat SEO. Pages that are found guilty of these methods are punished in their ranking, or are entirely removed from the search index. Similar algorithm expansions in addition to the Penguin update include Google Panda and Google Hummingbird. Because the aggressive deception and manipulation methods used by webmasters and online agencies commissioned to improve the ranking of their Internet page are escalating at great speed, Google felt compelled to rework its search algorithms. The introduction of the Panda update in 2011, which was mainly aimed at the editorial content of web pages, was followed by Google Penguin just a year later. This additional module is also known as Web spam Update because it targets spam methods, whose sole purpose is to position a specific web page in the SERPs (abbreviation for Search Engine Result Pages), i.e. push the search result pages displayed to the highest possible position. However, the top positions they have thereby achieved do not reflect the true significance of the real user behavior – the search results displayed are distorted. To provide Internet page operators and programmers with a guideline for professionalism, Google published quality guidelines with general and specific recommendations (see link). 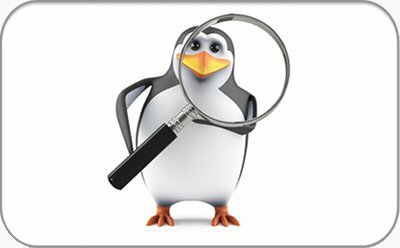 Although the exact workings of Google Penguin are kept secret, one can view these recommendations as a blueprint for Penguin’s approach. The top maxim listed is that a web page must be created for its users and not for a search engine. Furthermore, it explicitly states that one must refrain from using tricks and deceit, which could mislead the user or the search algorithm. Keyword stuffing: Placing an excessive number of keywords, which have hardly any relevant connection to the actual content, on one’s own web page. Cloaking: The presentation of a page often differs between real visitors and the search engine, for example in the form of types of media used or keywords. Sneaky redirects: Users are redirected to a page other than the one analyzed by the search bot. Concealed elements: Texts or links remain concealed for the real user (for example, text has the same background color, font size is zero or hidden behind a symbol) – however, they affect the search results. Internal links: These links refer to other elements (images, documents, subpages, etc.) within this web page and are mainly intended for the navigation. Outgoing links: These links guide users away from the web page to other domains. Incoming or backlinks: These links guide users from one place on the Internet to this web page. In a natural link pattern, the set links of a web page more often consists of internal rather than outgoing links. The link texts are generally neutral, i.e. the use of promotional keywords (“money keywords”) is kept to a minimum and, in terms of content, they generally refer to their own presence. Backlinks (incoming links) have a significant influence on the ranking of a web page because they are an indicator of how often the page is recommended by Internet users or other page operators by means of a link reference. Google Penguin therefore tracks and punishes activities where it is obvious that backlinks have been purchased or have been spread on the Web by other unnatural means. To this end, Google’s guidelines offer numerous recommendations listed under the heading Link Exchange Programs. The Google Penguin module was first released on April 24, 2012. It influenced approximately 3% of all search queries. In addition to smaller adjustments (“Data Refresh”), between 2013 and 2016 three larger algorithm changes were made under the designation Penguin 2.0 to 4.0. Meanwhile Penguin has been integrated into the core algorithm; data adjustments and their impact on the ranking are therefore permanently in real time.